I was a little worried the TV show was going to show the April Fool’s Day episode again and troll the fans, since technically that was the first episode of Season 3. I was delighted to see that we got a brand new one with episode two. 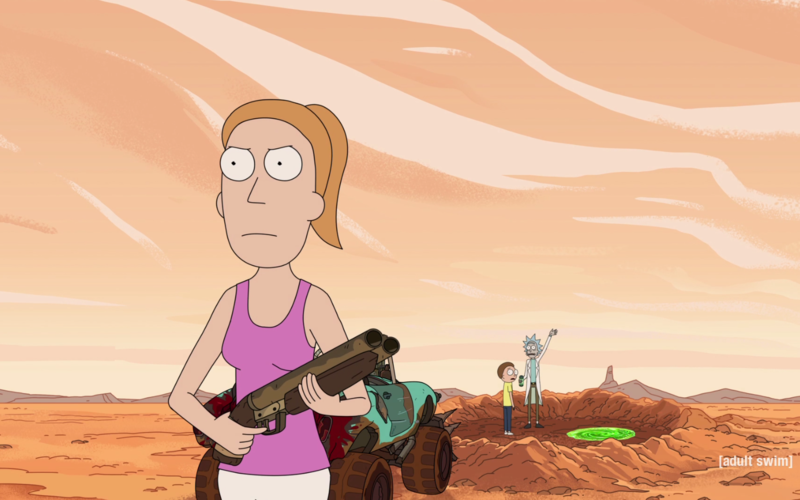 By the way, is it me or did anyone else lose connection to the Adult Swim website when trying to stream the new episode of Rick and Morty? Is the show so wildly popular that they couldn’t handle the massive spike in traffic? Fortunately, I’m pet-sitting for my neighbors and they have cable. I ran next door to watch the rest of the episode and only missed a few minutes. Also fortunately, the Adult Swim website had the latest episode available in their archive to stream for free when I checked a few hours later. I went ahead and re-watched the episode again. That’s how good Rick and Morty is. This episode picks up right after the last episode. Summer and Morty’s parents are finally separating. Summer doesn’t want to deal with watching her dad move out and prods their grandpa Rick to use his portal gun to take them on an adventure… somewhere… anywhere. Rick goes for it because he doesn’t want to deal with family drama, either. Morty reluctantly tags along after a minute, but is clearly sad to see his dad moving out. That somewhere ends up being a post-apocalyptic wasteland. We find ourselves watching a car chase across the desert, straight out of Mad Max: Fury Road. This action is fun to behold. It’s great to see the cartoonist’s homage to characters like Immortan Joe and his ilk. Later, back at the marauder’s camp, we see another homage character in the form of Lord Humungus from Mad Max 2. Summer starts hanging out with him and embracing life in the wasteland, as a way to escape her problems. Rick has other plans while he’s in camp. He wants to steal a radioactive meteor that the marauders worship as a god, but he needs a distraction. It so happens that they have a Thunderdome, like in the third Mad Max movie. 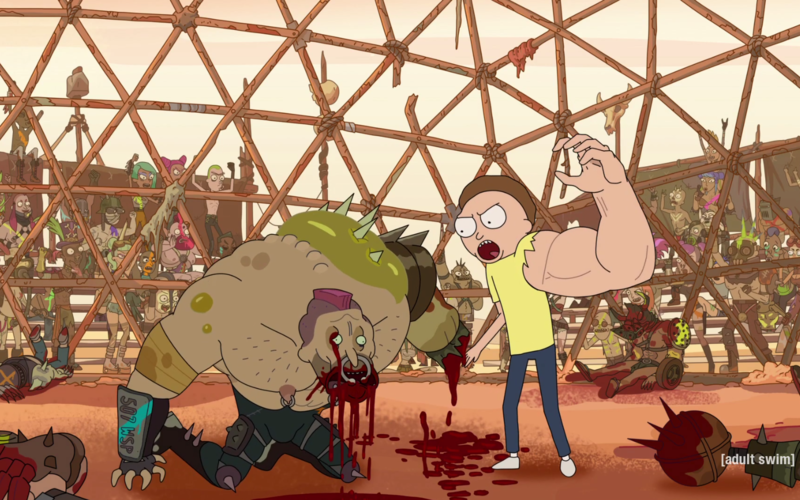 Rick gets his petrified grandson, Morty — always hilarious — to compete in the arena by injecting Morty’s left arm and making it massive and muscular. It’s amazing what one strong arm can do. It’s almost like watching the Winter Soldier fight in the Captain America movies, when you have one appendage that’s super-powerful. It’s a testament to the choreography that the animators lay down in these fights. Very cool, very bloody to watch. It’s also absurdly funny when the strong arm takes on a mind of its own and really gets into the action. 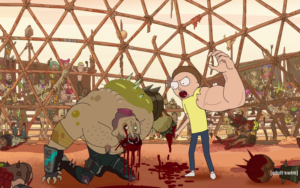 Poor Morty starts saying enough is enough after he wins several brawls and the arm starts motioning for other fighters to enter the ring, as Morty stammers in terror. These juxtapositions are what make this show so humorous. 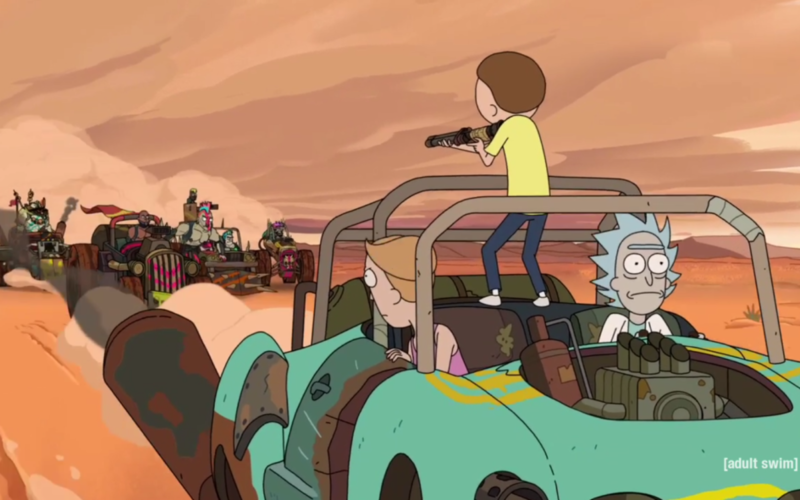 We’ll never get tired of Rick forcing Morty into absurd situations and watching his grandson nearly go crazy. It’s good to know the series creators haven’t forgotten what makes us laugh. Why? Because he can. And I can’t wait to see if Pickle Rick is as fun as last season’s Tiny Rick. Stay tuned.